Protein is essential for muscular development and growth. The average adult male needs to consume approximately 56 g of protein a day, while women need 46 g, according to the Centers for Disease Control and Prevention. Meat provides a high amount of protein, and several types of meat are low in calories and saturated fat. Strive to consume a healthy balance of protein, complex carbohydrates and minimal fats at every meal -- especially after a weightlifting workout. In addition to lean meats, try egg whites, low-fat dairy products, nuts, seeds and legumes to achieve your daily recommended amount of protein. A 100-g serving of roasted turkey breast contains 7.4 g of fat, 189 calories and 28.7 g of protein. Leaner versions of turkey contain less fat, such as 98 and 99 percent fat-free ground turkey varieties. Serve roast turkey with a side of vegetables and a sweet potato for a satisfying, nutritious meal. You may also serve seasoned, cooked ground turkey over brown rice and a tossed salad on the side. 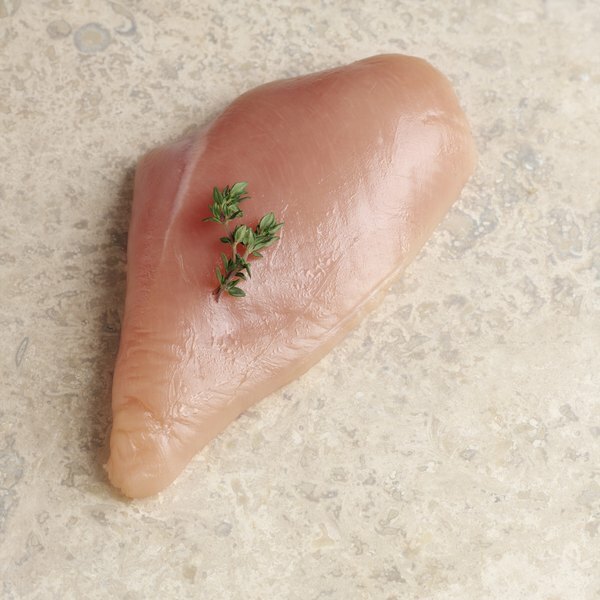 Roasted chicken breast with the skin provides 7.8 g of fat, 197 calories and 29.8 g of protein in a 100-g serving. However, remove the skin and boil, bake or grill the chicken breast for fewer calories and less fat. Slice and serve it over a salad or with a side of steamed vegetables and whole-grain pasta. Many nutritious varieties of fish exist, but some offer more protein with less fat. A 100-g serving of cod contains 0.9 g of fat, 105 calories and 22.8 g of protein. Perch provides 1.2 g of fat in a 100-g serving, with 117 calories and 24.9 g of protein. The same amount of pollock contains 1.3 g of fat, 118 calories and 24.9 g of protein. Cook your fish in olive oil to add minimal saturated fat to your meal. Serve with steamed asparagus and wild rice. Pork is not generally thought of as a healthy meat, but lean varieties offer many nutritional benefits. A 100-g serving of lean, roasted pork provides 9 g of fat, 199 calories and 27.6 g of protein. Serve with a side of mixed vegetables and a slice of whole-grain toast. What Nutrients in Meat Help the Body to Function?